5112 SW 126th St., in Oklahoma City Just Listed! Posted by Rob Schaerer on Wednesday, July 16th, 2014 at 12:00pm. 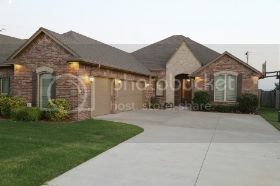 5112 SW 126th St. Oklahoma City, OK Just Listed! This is a beautiful newer home in Williamson Farms, a gated community. It has an open floorplan in the kitchen and living areas, with granite countertops everywhere! The fixtures have been updated, and the kitchen has maple cabinets, an accented bar, gas stove, pantry, and stainless steel appliances. The home has a split bedroom floorplan with a jetted tub and large tiled shower in the master bathroom. There are real hardwood floors in the study! This home also has a side entry garage with a third full bathroom inside perfect for outdoor projects. Last, but not least, it has a large covered patio in the backyard, which backs up to an open field.